Watch to find out who won! Would you like to win a FREE Believe in it® Athletic Training Top? We got Orange! We got Blue! Shipping is free and anyone in the world can participate! Believe in it® is apparel that inspires you to reach your goal. It's for motivated athletes. All ages, all sports. Believe in it® is an OSA World Juggle-a-thon sponsor. 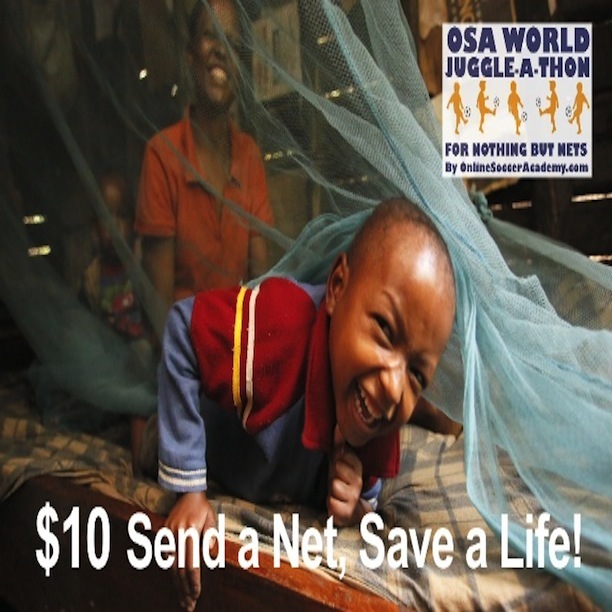 The OSA World Juggle-a-thon for Nothing But Nets is April 25th - World Malaria Day. You can take part anywhere in the world you have a ball. $10 is all it takes to send a net and save a life. Join us and Juggle to to Get Better, Juggle to Save Lives. If you win the Believe in it® shirt we will even thrown in a free Believe in it® sticker and bracelet! You can earn up to 5 entries! Register as a Juggler for OSA World Juggle-a-thon. If you are already registered then you are AWESOME and you are automatically entered. Make a "One Time Donation" to Nothing But Nets via the OSA World Juggle-a-thon. Then email me your receipt and that will enter you. Copy and Paste the Social Status Updates we have prepared for you below. Use them in your social networks. Make sure you follow directions to tag me and Nothing But Nets correctly in Twitter, Facebook and Instagram so I can see your posts and include them as entries. You can only enter the contest 5 times so please don't share the social media posts a billion times and upset your friends. This Believe in it® Shirt contest starts Wednesday, April 16, 2014 and ends at midnight eastern standard time on Friday April 18, 2014. I'll pick a winner at random and let you know who won on Saturday April 19th. Start registering, start donating and start sharing. Game on!! Do you want a FREE Jared Montz Autograph Card? This is a limited time offer! 1. Buy a Believe in it® shirt at BelieveinitApparel.com. 2. Use promo code "JM10" at check out. 3. The Believe in it® shipping team will include an autographed card signed by me in your package. Bonus! The promo code gets you FREE SHIPPING too! Shipping and Handling = $4.95 saved. This limited time offer expires on Sunday April 13, 2014 at midnight eastern standard time. It's for Motivated Athletes; all ages, all sports. This is the parent company of the Online Soccer Academy. We have high quality athletic training tops and comfy t-shirts. It's the same quality you expect, but the inspiration you want. We have free and easy returns too! Buy your Believe in it® shirt today at BelieveinitApparel.com.